John DiMaggio in a photo posted on his Facebook page in January 2013. 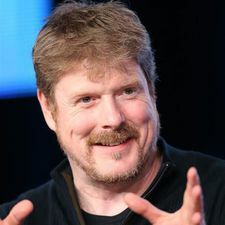 John William DiMaggio is an American voice actor, actor and comedian who is one of the primary voice actors on Futurama, voicing Bender Bending Rodriguez and dozens of secondary and one-time characters. Before getting into acting he was a stand-up comedian in the comedy duo "Red Johnny and the Round Guy", and today works mostly as a voice actor. Outside of Futurama, he can be heard doing voices in Jackie Chan Adventures, Samurai Jack, Kim Possible, and Teen Titans, as well as The Animatrix and Princess Mononoke. Recent work includes playing Rico the Penguin in the Madagascar franchise, Shnitzel from Cartoon Network's Chowder, Jake the Dog on Adventure Time, and Final Fantasy XII as the voice for Gilgamesh. He also provided the voice for Grievous and Sha'a Gi for Chapter 20 of Star Wars: Clone Wars. John DiMaggio shares a name with Billy West. DiMaggio has won several beat-box competitions, and demonstrated his skill by beat-boxing the Futurama theme for "Bender Should Not Be Allowed on Television". The original run ended in 2003. The first film was released in 2007. In 2005, DiMaggio reprised the role of Bender for the episode "Future-Drama" of The Simpsons. DiMaggio does voices in the Xbox 360 game, Halo 3, in which Bender is referenced in a few Marine quotes. ^ Gilgamesh is mentioned in "The Inhuman Torch". This page was last edited on 2 February 2016, at 21:05.